Car key replacement can be handled several different ways. You can go to the dealership, do it yourself, or you can call a locksmith. Each one of these options has its own pros and cons. Dealerships will be the most expensive, but are trustworthy. The do it yourself (DIY) option will be the cheapest, but it relies on your ability and the quality of the products you purchase. Locksmiths are a nice middle ground of price and trust. No, you do not need your original key. However, if you have your original key, this will help the car key replacement process. The existing key can be duplicated without the need to find the key code. If your key does not have a metal blade at all, and only uses a fob, then having an extra will do little more than prove ownership. Yes, if you do not have your original key, there is no need to worry. Modern age car key replacement can be done without physically having the key that needs to be replaced. 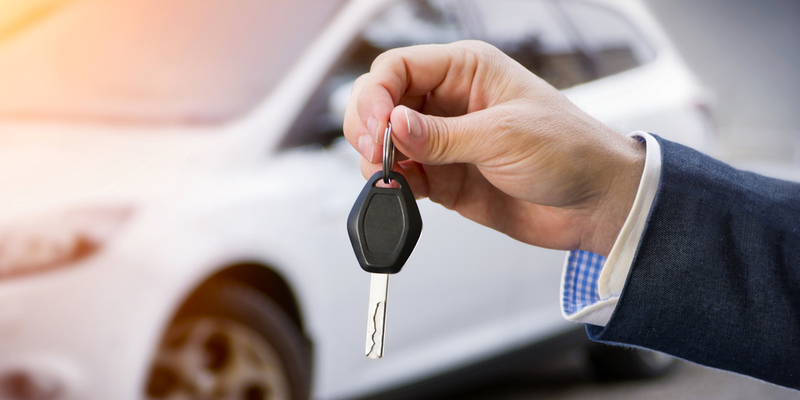 Once United Locksmith verifies your ownership of the vehicle, we can cut the key from code with your Vehicle Identification Number (VIN). Yes! You will need a new device that has never been programmed. Once a fob has been programmed to a car, it cannot be reprogrammed. 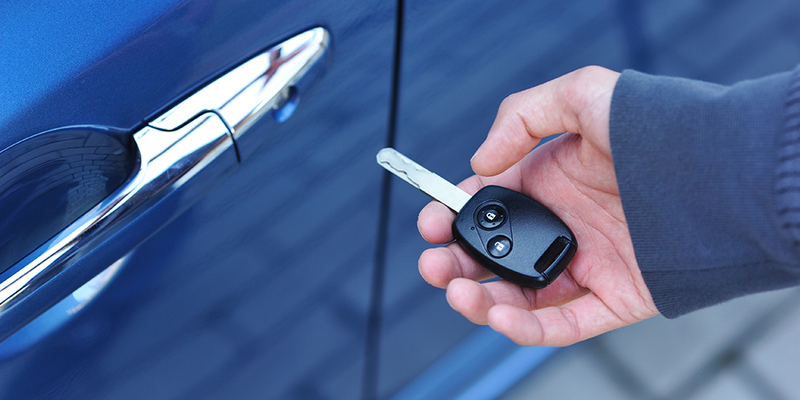 Our United Locksmith automotive technicians can acquire and program key fobs, and keyless entry devices. No matter what type of car key replacement you need, we are here to help. Bow – This part of the key is where the thumb and index finger are placed to operate the key. The bow is often shaped as a circle or rectangle. Your key fob buttons may also be found on the bow if they are part of the same unit. If your bow has a plastic coating, then that is a good indication that it contains a transponder chip. When your key is simply a length of metal, there is no place to conceal the chip. Bitting – The bitting of a key are the cuts that manipulate the internal mechanisms of the lock. They are also referred to as the ridges or teeth of the key. Depending on the type of lock, the bitting will be oriented differently. Most often there is a serrated type of bitting on both sides of the key. On newer cars there is a snake or worm type pattern on the sides of the key. Wards – The wards on a key are what keeps it from fitting in different keyways. These are cut on the key that do not affect the internal components at all. It is just to keep Toyota key from fitting in a Mercedes lock. The warding requires you to purchase key blanks from the car manufacture. Blade – This section of the key is where most of the action happens. The blade holds the bitting, the tip, and the wards. It either ends at the shoulder or the bow of the key (whichever comes first). When the blade of the correct key is fully inserted into the corresponding lock, rotation of the key will open the door and/or start the vehicle. Everything that is outside of the lock when the key is fully inserted is not the blade. Tip – The tip of the key is the end that is inserted first into the keyway. It is on the opposite end of the key as the bow. To insert a key, you must line up the tip with the keyway. Almost every car key is set up to be inserted two different ways, so the tip only needs to be oriented so that the blade fits horizontally or vertically in the lock. There is rarely an option to place the key upside down, as both ways will technically be right side up. Shoulder – Many car keys do not have a traditional shoulder. This is the part of the key that keeps it from being over-inserted. It exists to orient the key in the keyway so that the user knows when to stop pushing the device deeper. Most often this shoulder is achieved by the blade of the key widening as it approaches the bow. Other times the shoulder is just an elevated piece of metal that is larger than the keyway. Keys that are meant to open wafer locks can be identified as having grooves on both the top and bottom of the blade. The double serrations are made so that the key can be inserted two different ways. However, most wafer locks found on cars have wafers on the top and bottom of the lock. That means that the bitting on these keys moves some wafers up, and moves others down. These locks work very similarly to a standard pin tumbler lock. The wafers are spring loaded and are raised by the bitting on the key to different heights. The height they need to be raised corresponds to the size of the wafer. The longer the wafer, the deeper the groove. If the wafer is shorter, the groove will be shallower. The wards will be found on the sides of these keys. These wards will be flipped images of one another because the key will need to work two different ways. The security of these locks is not all that impressive. There are many tools that exist which will open the lock without the proper key. Items such as jiggle keys, Marshal keys, and wave keys can be inserted into the keyway in order to open the lock. These skeleton keys have different methods of operation. Some need to be moved about in the lock while other only need to be inserted and turned as if they were the correct key. Additions to a traditional wafer key will help with security. For example, a transponder chip placed in the plastic coating of the bow will keep the car from being started with one of these keys. However, a transponder chip will not keep a thief from opening the door to your car. If your car key replacement requires that a wafer key is cut, make sure that you also check to see if you need a transponder chip. A key that moves sliders is known as a slider key. These keys are easily recognizable for the snake-like path that is cut into the sides of the blade. In almost all cases, this pattern will appear on both sides of the key so that it can be inserted two different ways. Similar to wafer locks, these paths are used to elevate or depress the internal components of the lock. The sliders in the lock ride along the path that is cut into the key, and when the key is fully inserted, all of the sliders should be at their appropriate height. Unlike the sheer lines in a wafer lock, the slider lock will have different gates. Each slider needs to be fitted into a gate so that they will be out of the way and allow the lock can turn freely. This means that the deepest gate will always be the true gate. For security, multiple unnecessary gates are added to the lock. These are known as false gates and do not provide the adequate depth to have the slider leave the lock unobstructed. If there are no false gates in the lock, these devices will be incredibly easy to pick or rake open. This should not be a concern to most car owners because very few criminals pick locks, and an even fewer number of car thieves pick locks. In addition to this, most slider keys act only as a backup. They are the key of choice for most smart key systems, and will not start the car without the fob present. Often these keys will be hidden within the fob, and slide out when a button on the fob is depressed. Once this button is pressed, the key can be pulled free. Remember to put this key back in the slot until it clicks and locks into place. If your car key replacement requires a slider key to be cut, this is no issue. All it requires is a laser key cutter. United Locksmith can cut that key, and get you back to feeling safe knowing that you will always have access to your car. A key fob, which is also referred to as simply a fob, is the electronic part of the key. A key fob is often described as a remote of sorts. This remote will open your doors with the click of a button. On newer push button ignition cars, the fob is the needed to start the vehicle. With proximity sensors, the fob can act as a security token. A security token is a term used in the world of electronic locks. What it means is that the fob is a device that is used to authenticate the user, and grant them access to something that would otherwise be secure. Instead of this token needing to be swiped against a lock, it can transmit a signal to the car. This will be done by the use of Bluetooth, infrared, or near field communication (NFC). By simply approaching some cars, the fob will open the door locks. The fobs that allow you to simply open the car with the key in your possession are often called Smart Keys. This is the same technology that allows the car to start with the push of a button. One of the newest trends on key fobs is the remote start. What that means is that your key fob can be used to start the car before you are inside. In the same way, that your doors can be opened or locked while you are quite a ways away, now some automobiles offer that same ability for starting the car. This feature would of course not be complete without the ability to remotely turn off the vehicle. The key fob is many things. It can be your only way to start your car or just an added convenience. It may be on the key itself, or it may be a separate device. Whatever the case, if you need this type of car key replacement, there is no better place to than United Locksmith. Our mobile auto locksmiths can come to your location and complete most jobs on site. In the event that this is an emergency call, or you need a service tech to diagnose the issue before you know what your issue is, the proper parts may need to retrieved before the job can be completed. However, if you schedule an appointment, and explain what you need, we can have all of the necessary products ready for programming by the appointment time. A transponder key uses two key systems in conjunction with one another. First of all, you will have the traditional key, which will be either a slider or wafer key. This key works just as any other key would. It is fully inserted into the locks and turned. The operation is the same for the doors, trunk, and ignition. The second system that comes into play is the transponder chip. The word transponder is a portmanteau of ‘transmitter” and “responder”. It is an electronic chip with a non-volatile memory. This keeps the programming on the chip from being erased when power is removed from the device. When the key is turned in the ignition cylinder, the car releases a small electronic field which gives the chip power. With this energy, the transponder chip sends a message to the transceiver in the car. The transceiver can be found in the key ring, which wraps around the ignition cylinder. If the signal is correct, then the car will start. The transponder is the is the male (key), and the transceiver is the female (key ring). This type of security is meant to disable fuel injection and/or the starter of your vehicle if an unprogrammed or misprogrammed key is used. The distance that the transponder chip can be from the transceiver varies. In some cars, it is the exact distance from the key ring to the bow of the key once the key is fully inserted. This can also be as imprecise as just in the front two seats of the car. If you lose a transponder key, then you will need a new one that has not been programmed. Your car key replacement needs to include a key that has been cut appropriately and a chip that has been programmed correctly. All of this can be accomplished at your convenience by our auto locksmiths.